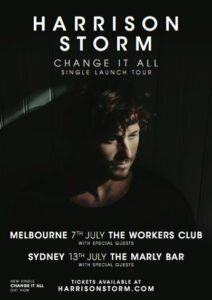 Australian singer-songwriter Harrison Storm is the latest addition to Nettwerk Recordsimpressive roster and is celebrating with the release of a new single alongside headline shows in Sydney and Melbourne. “Change It All” follows on from the viral success of “Sense Of Home,” the title track from his 2015 debut EP. “Sense Of Home” placed prominently on key Spotify playlists, amassing an impressive 8.5 million-plus streamsand catching the attention of Nettwerk C.E.O. and co-founder Terry McBride, who personally signed Storm after sending him a Facebook message. “An artist like Harrison couldn’t have come from anywhere else but the Australian surf coast where busking, surfing and friends are the essence of a tight musical community. He dives into the music with subtle touch, but lyrically is stridently direct. We’re very happy to have him join the Nettwerk roster and excited for what’s to come,” says McBride. The EP’s success saw Harrison perform to packed crowds across Melbourne, developing a powerful presence on stage alongside the likes of Michael Franti, The Cat Empire, Husky, and more. Simultaneously receiving Australian radio play and airtime on U.S. tastemaker KCRW. It’s been a lifelong journey for the troubadour to reach this point. Growing up on theMornington Peninsula, a five-minute walk from the ocean, he fell in love with music as a young kid. Storm went from listening to Neil Young and The Beatles to becoming a disciple of Jeff Buckley, City and Colour, and Angus & Julia Stone by high school as well as devouring the works of Jack London. Along the way, he developed a singular style, merging impressive classically inspired finger-picking and a soulful hypnotic vocal delivery equally resonant of alternative, folk and blues. “I was in a real rut when I wrote this song [“Change It All”]. A sort of slow spinning, downward spiral you can find yourself in when things become monotonous,” he admits. “I was quite down about everything. I’m usually an optimistic person, but I wasn’t enjoying music as much as I used to. Then, I got this message from Terry and it really lifted my spirits,” says Harrison. “Change It All” sets the stage for Storm to impact listeners everywhere. You can catch his impressive live show in Sydney and Melbourne through July. Click here for more details.